Description: Elegant map of the Moon with beautifully engraved detail showing the topography and surrounded by a listing of the then observed 381 craters. German text. Coloured. 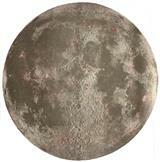 Description: Impressive and highly detailed map of the moon published by the United States Geological Survey. Framed in a hand-crafted circular frame (measures 46 inches in diameter).